White Rose has been performing well in the 4NCL. I put it down to good team spirits. This is the second time I have played for White Rose, the first being in 2008 when I was a replacement for Anya Corke who had a family emergency. Since then I’ve switched teams every year, playing for Bristol, Pandora’s Box, North East England and now back for White Rose. Gawain had been a player for White Rose for a long time. They supported him as a junior and I think that he still counts as an honorary member. Why all the team switching? Well, long story short, it just happened that way. 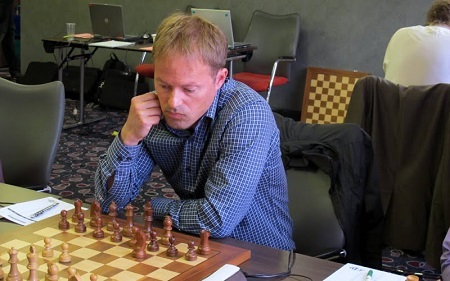 Gawain has been playing for professional teams who have already had a strong IM / GM female player and I wanted to play on a high board for North East England in Division 2 as opposed to playing Board 8 in Division 1. I’m not sure what I scored last year (just checking the ECF Grading Database) but our team didn’t fare well and were relegated to Divsion 3.I scored 5/9 against a 2161 average. This year the 4NCL has allowed players to use a conversion of their English grade instead of their FIDE Rating. My 205 Grade converts to 2290 (not sure that’s my rating but hey ho) and so I don’t always have to play on board 8. This weekend, however, I played board 8 both days. Why you might ask? Well sometimes you’ve got to help the team. I’m also never trying to specifically play or avoid other female players, instead I aim to try and play strong people. Saturday, Round 7 White Rose faced Guildford 2. We were slightly outrated but only just. I played IM Dagne Ciuksyte originally from Lithuania she now lives in England. Our game followed the recent Svidler-Topalov game from the Candidates in Khanty-Mansiysk. Dagne didn’t play the critical line and instead followed an old game of hers when I managed to use an improvement Gawain had suggested.Thanks to my husband I got an edge and I managed to convert the game comfortably. Why did it gel this weekend when for so long I’ve not been so interested? I don’t know. I guess if I knew the answer I’d be able to make Gawain World Champion. Sometimes it works but I know I got a lot of rest, spending the morning napping as opposed to the gym and I had my snacks with me, although my game was only 22 moves so I didn’t need them this time. After my game, I decided I needed to hit the gym. So off I went to do a 5km run and 5km cycle. Then I was starving and we had to wait for Ga and my team to finish. FM James Adair successfully saving a worse endgame meant we won 5-3. 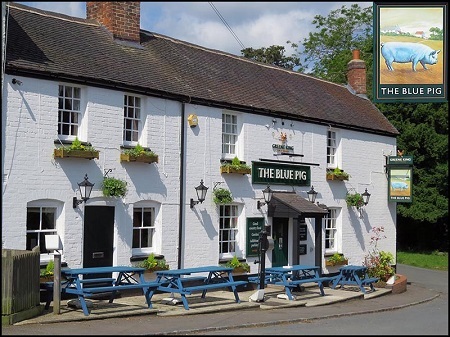 We ate at the Blue Pig in Wolvey. What did I have? Ribs! Why?? Well I’m not such a strict vegetarian anymore. Okay, I’m probably not a vegetarian any longer but I just love eating my vegetables! So I struggle in small villages where it’s all about the pub grub – but don’t get me wrong, I love pubs! So what’s my overall review? Portion size – HUGE. If you are a teenage boy and hungry, head there otherwise I would avoid. Next time my team captain emails around asking about dinner options I’ll be more vocal. The Blue Pig was definitely better than the pub around the corner but I wouldn’t call it a Gastropub. We finished quite late, headed back to the venue around 11.30pm. I headed to bed as I know how much I need my sleep. 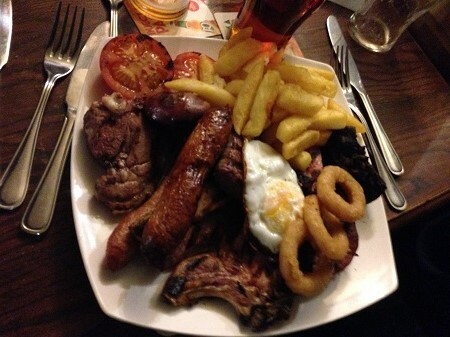 The mixed grill (from the Blue Pig) which rumours has it that a former Women’s World Champion has devoured completely! With the victory White Rose qualified for the Championship pool and in contention to qualify for the European Club Cup held in Bilbao later this year. In round 8 we faced Cheddleton and Guildford 1 had to play Guildford 2. We managed to beat Cheddleton 6-2. I played WIM Fiona Steil-Antoni who I had played once before in Hastings. I had a won position but she defended well and it was a draw. Knowing that I had nearly beaten her before, I really knuckled down and knew if I was going to get a good position to just slowly keep it moving.